We all love soccer – but how badly do you want to win? FootLOL lets you use mines, shields, aliens, cows, guns and many more cheats to decimate the opposing team and protect your players. As a manager, you’ll take your team through a few training matches before being unleashed on new planets. As you go, you’ll unlock new gadgets, improve your players’ performance, and unlock new kits and hats for them to wear. Opponents often have the same tricks you do so it’s not as simple as knocking the ball in the back of the net! 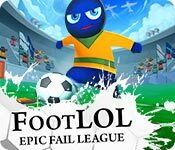 FootLOL: Epic Fail League is rated 4.1 out of 5 by 8. Rated 5 out of 5 by cerveza1980 from You Have To Try It, Such Fun!!!! This one actually put a smile on my face and had me really getting into the whole sports side of things - eg yelling at the players etc, even tho i was just blowing up the enemy players and mine too oops, only played for 10 mins before buying. 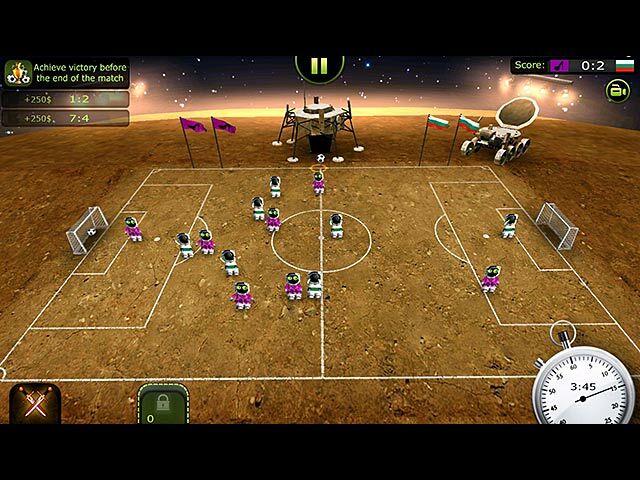 (and i dont generally like football or similar sports) Give the demo a go and see for yourself. Just a great little fun game! Rated 5 out of 5 by Snowfoxx from Chaotic futbol fun! This is the league that FIFA forgot about and for a damned good reason. These are the silliest futbol players ever! This game is going to go all over the globe, and there will be some new things added to the game that will never happen in the real game. Manchester United might have to deal with fanatical patrons, but they never had to deal with this! 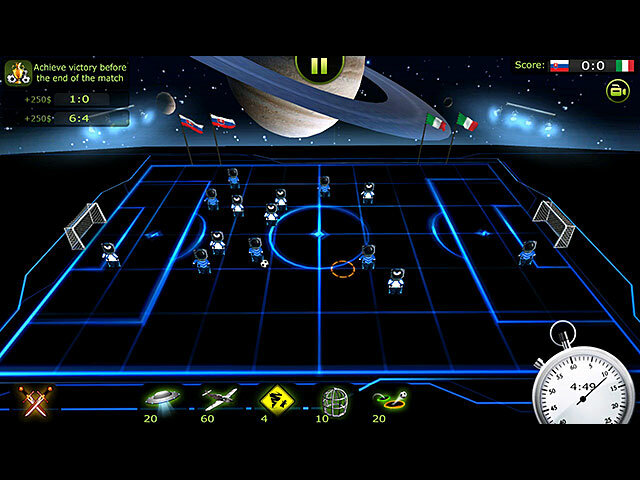 At the start of the game, you choose your nation, and a coach gives you a tutorial. In these games, you earn cash for winnning game, or playing games for a certain score to please the team's investors. With these winnings and such, you can buy new tools and upgrade slots to add skills to your game. These skills and tools are waht makes the game very interesting. You can use mines, oilslicks, speed potions, force fields, and more to help your team win. You can only use certain items per game, though. Your team consists of little players with blue heads, some kind of Fisher-Price body and little arms. Your goal-tenders need those. I found it to be really fun to cut loose with the tools and just let the game run itself until time was called. It was noisy and chaotic, but loads of fun! If you love soccer, football, futbol or whatever they call it in your country, and don't take it too seriously, then FootLOL: Epic Fail League is perfect for you. This is another game you'll spend the weekend playing and never getting to that honey-do list. Soon, Sunday night will be here, and you'll wonder where all the time went. Rated 5 out of 5 by Zellian from Tower Defense Meets Soccer Every so often a game comes along that is completely different from what we usually see from BFG. 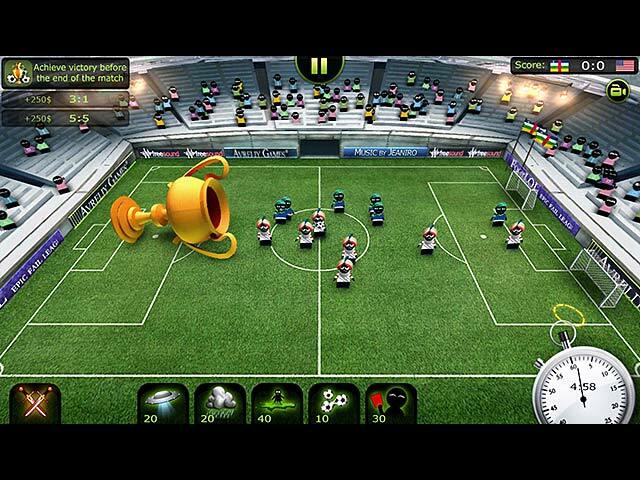 FootLOL takes a bit of getting used to at first because it's a completely new concept for a strategy/sports game. You can't control your team's individual players, but you have the ability to change their stance between aggressive and defensive which increases their overall speed on either side of the playing field. Besides this there are all sorts of upgradable and unlockable abilities that allow you to manipulate the playing field, so you can affect the actions of all the players and the ball itself. It plays and feels very much like a tower defense game, and it has some Sim game series elements as well. You are basically an omnipotent power in this game and you throw whatever skills you have in your arsenal at the playing field in hopes the ball will go in the other players net. The levels are quite numerous and all have individual goals that are set for you to meet be able to continue further. You can also purchase custom outfits for your team on top of the numerous default options. The game is rich in its sounds, they are very appropriate and humorous. The graphics could be slightly better, but it does support full 1080p so I can't ask for much more really. Lastly, there is a single match mode where you can customize the game options, but I found it uninteresting compared to the Championship large campaign mode. Highly recommended. Rated 5 out of 5 by kosta99 from Pure fun! This is an arcade football with mines, crazy cows and fireballs. There`s not much of a story, but gameplay is awesome. You can upgrade your teams skills and customize the appearance. Rated 4 out of 5 by pennmom36 from LOL IS RIGHT! Okay, this wasn't the best game I have ever played, but what's not to like about blowing stuff up? Someone has a good sense of humor to come up with this game. First you select your team by choosing what country you want to be. Upgrades are available as you earn stars to get headgear etc. You place mines strategically on the playing field, to keep the opposing team from making a goal as well as helping your teammates score a goal. Personally I didn't care about making points I just loved seeing everybody blow up all over the field! As you progress you earn other tools like shields to protect your players or speed up a specific player. The graphics aren't anything to write home about but it doesn't really matter just have some fun with it. Enjoy! Rated 3 out of 5 by tailswhiskers from Very boringggggggggggggggggggggggggg This game is very boring. All you do is play soccer with different teams. I did not know what the storyline was. I guess it was to win all of the games against the different teams. I would not recommend this game. Rated 1 out of 5 by fatg1t from This Game Is Truly Dreadful! There are two words in the title of this game that sum it up perfectly and they are EPIC FAIL! You do not control the players. The players slide around the pitch passing the ball with no kicking action. 'To 'help' your team win' you place landmines on the pitch that blow up when a player from either team slides onto one rendering the player out of action for a short time. How this is supposed to help the player win?!?! IT IS STUPID! As you have no idea where and which way your players are going the landmines DO NOT HELP THE PLAYER TO WIN!